Today, Jazz It Up Truck and Auto Accessories in Centennial, Colorado is here to help you understand the difference between leveling vs lifting your truck. Our team of auto accessory experts has the information to help you determine the best option for your vehicle this year, and we have the right team to install it, however, you choose to jazz up your truck this year. So, let’s break down what you need to know about leveling vs lifting your truck. Hot off of the factory floor, most trucks come with a degree of “rake.” This is built into the suspension and makes the rear end of the truck sit higher than the front end. Because trucks are designed to haul, the back end will then be able to accommodate extra weight without a “sag” in the rear end. Going without rake could result in a very uncomfortable ride and more dangerous handling, as well as wear out the shocks, bushings and other parts much faster. A truck leveling kit will level your truck out by raising the front end a few inches, eliminating the factory rake and bringing your truck in line. This will add a bit of clearance to the front end and let you put on bigger tires. Your payload will also remain the same, as the back end is left alone. Leveling kits use coil spacers, torsion keys and strut extensions, depending on your unique ride to create the right effect. Sometimes they can even be installed without jacking up the vehicle. No matter how it’s installed, a leveling kit will give your truck a more aggressive stance. 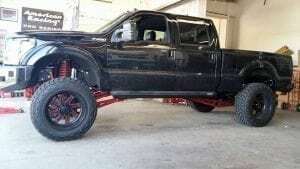 For an even more aggressive stance, you can choose a lift kit for your truck instead. This can raise the front and back from just an inch to an extreme height. It depends on what you want. There are two types of truck lift kits, body lifts, and suspension lifts. Body Lift – A body lift kit will use spacers and blocks to lift the body higher into the frame of the truck. So, you will get extra height which allows for more massive tires, but the ground clearance, suspension geometry, and steering geometry stay the same so that handling will remain relatively the same as before the lift. But because of the extra ride height, stability may be affected. Suspension Lift – A lot more is involved with a suspension truck lift. This involves changing a lot more components, including shocks and struts, leaf springs, control arms, trailing arms, driveshaft, and steering components. This is much more involved process than the other options mentioned above. The more related components that you can upgrade, the better suspension articulation you will have. But the results will transform your truck into a truly off-road vehicle. You can swap out your current tires for larger heftier ones. You will have more ground clearance. You will feel different from the moment you get into your lifted truck. The driving dynamics and stability can be impacted by the higher center of gravity, and both altered suspension and steering geometry. Now that you know the facts about leveling vs lifting your truck, don’t be shy. Stop by Jazz It Up in Centennial today to talk about your next truck upgrade.